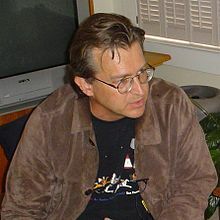 Phil Cousineau (born 26 November 1952 in Columbia, South Carolina) is an American author, lecturer, independent scholar, screenwriter, and documentary filmmaker. Phil Cousineau was born in an army hospital in Columbia, South Carolina. He has worked as a sportswriter and taught screenwriting at the American Film Institute (AFI). American mythologist Joseph Campbell was a mentor and major influence; Cousineau wrote the documentary film and companion book about Campbell's life, The Hero's Journey. The author of more than 25 nonfiction books, Cousineau has more than 15 documentary screenwriting credits to his name, including the 1991 Academy Award-nominated Forever Activists. Cousineau grew up just outside Detroit, once known as "the Paris of the Midwest,” with French Canadian roots. While moonlighting in a steel factory he studied journalism at the University of Detroit. Before turning to writing books and films full-time, Cousineau’s peripatetic career also included playing semi-professional basketball in Europe, harvesting date trees on an Israeli kibbutz, painting 44 Victorian houses (also known as Painted Ladies in San Francisco), teaching, and leading art and literary tours to Europe. An expert on mythology and film and the monomyth "hero journey" structure of screenplays, Cousineau consults on scripts, books, and writing projects of all kinds. An inspiring speaker, he lectures frequently on themes of sacred travel, sports, mentorship, writing, and creativity to diverse audiences. Cousineau is currently the host and co-writer of the Link TV television series, Global Spirit, interviewing guests such as Robert Thurman, Karen Armstrong, Andrew Harvey, Deepak Chopra, and Joanne Shenandoah. “I try to put myself in the position of people I know who are curious about cultures,” said Cousineau in The New York Times, “and try to ask what they would ask if they were in my lucky shoes.”  Broadcast journalist Bill Moyers has commented that “The discussions on Link TV’s Global Spirit series are sorely needed in this dispirited and disenchanted world. In many ways it is more important than journalism today.” The first season of Global Spirit was presented by John Cleese and broadcast on PBS-TV stations nationwide in the United States in 2012 and 2013. A self-avowed night owl, Cousineau published Burning the Midnight Oil, a book of essays and poems about finding inspiration in the night, in 2013. He discussed his love of the night with Scott Simon on NPR along with forewordist and holy fool Jeff Dowd of The Big Lebowski fame on the winter solstice that year. Cousineau lives in North Beach, San Francisco, California and is currently writing a book about beauty and the Venus de Milo, as well as a young adult novel about baseball. On Art: "Art is the making of something the world’s never seen before in images or words. It is creation itself on a human level. It is as necessary as breathing because it is our greatest means for learning about and conveying to others what life means. Art is a meaning-making machine. Without it, we are stammer and grasp, like Eugene O’Neill’s fog people." On Words: "Who knows why some words ignite the hearts of some readers while others are like wet matches that won't light." "The creative urge matters. Stories matter. Images matter. It matters that you were born with a genius, a guiding spirit, a daimon that may know more about your destiny than you do." "But what if your fire is not burning well or, worse, has gone out? Without inner fire, you have no light, no heat, no desire... there's only one way out - and that's through the dark woods. You must change your life." "The practice of soulful travel is to discover the overlapping point between history and everyday life, the way to find the essence of every place, every day: in the markets, small chapels, out-of-the-way parks, craft shops. Curiosity about the extraordinary in the ordinary moves the heart of the traveler intent on seeing behind the veil of tourism." "In each of us dwells a pilgrim. It is the part of us that longs to have direct contact with the sacred." "The pilgrim is a poetic traveler, one who believes that there is poetry on the road, at the heart of everything." "Are you alive now at home? Are you going to stay in your coffin of mediocrity, [or] break out of your cage, and take a journey to discover this in order to find yourself?" "What every traveler confronts sooner or later is that the way we spend each day of our travel...is the way we spend our lives." "Have you ever made a vow to go someplace that is sacred to you, your family, your group? Have you ever imagined yourself in a place that stirred your soul like the song of doves at dawn? If not you, then who? If not now, when? If not here, where?" "Mapping out dozens of deeply focused trips around the world has convinced me that preparation no more spoils the chance for spontaneity and serendipity than discipline ruins the opportunity for genuine self-expression in sports, acting, or the tea ceremony." "The force behind myths, fairytales, parables and soulful travel stories reveals the myriad ways the sacred breaks through the resistance and shines forth into our world. Pilgrimage holds out the promise of personal contact with that sacred force." "What is sacred is what is worthy of our reverence, what evokes awe and wonder in the human heart, and what, when contemplated, transforms us utterly." "Uncover what you long for and you will discover who you are." "Our task in life is to find our deep soul work and throw ourselves headlong into it." On Synchronicity: "[Synchronicity is] an inexplicable but profoundly meaningful coincidence that stirs the soul and offers a glimpse of one's destiny." On the Soul: "As the ancients said, the soul is realized in love." On the Hero's Journey: "The journey of the hero is about the courage to seek the depths; the image of creative rebirth; the eternal cycle of change within us; the uncanny discovery that the seeker is the mystery which the seeker seeks to know. The hero journey is a symbol that binds, in the original sense of the word, two distant ideas, the spiritual quest of the ancients with the modern search for identity, “always the one, shape-shifting yet marvelously constant story that we find." Cousineau, Phil (Dec 2013). Burning the Midnight Oil: Illuminating Words for the Long Night's Journey Into Day. Viva Editions. pp. 244 pages. ISBN 978-1-936-74073-4. Cousineau, Phil (Sep 2012). The Painted Word: A Treasure Chest of Remarkable Words and Their Origins. Gregg Chadwick (illus.). Viva Editions. p. 336. ISBN 978-1-936-74017-8. Smith, Huston; Phil Cousineau (Sep 2012). And Live Rejoicing: Chapters from a Charmed Life — Personal Encounters with Spiritual Mavericks, Remarkable Seekers, and the World's Great Religious Leaders. New World Library. p. 248. ISBN 978-1-608-68071-9. Cousineau, Phil (February 2011). Beyond Forgiveness: Reflections on Atonement. Huston Smith (foreword). Jossey-Bass. p. 272. ISBN 978-0-470-90773-3. Cousineau, Phil (April 2010). Wordcatcher: An Odyssey into the World of Weird and Wonderful Words. Gregg Chadwick (illus.). Viva Editions. p. 305. ISBN 978-1-57344-400-2. Cousineau, Phil (January 2010). The Oldest Story in the World. Sisyphus Press. p. 84. ISBN 978-0-9626548-9-3. Cousineau, Phil; Scott Chamberlin Hoyt (September 2009). The Meaning of Tea: A Tea Inspired Journey. Talking Leaves Press. p. 362. ISBN 978-0-615-20442-0. Cousineau, Phil (May 2008). Stoking the Creative Fires: 9 Ways to Rekindle Passion and Imagination. Conari Press. p. 224. ISBN 978-1-57324-299-8. Smith, Huston; Cousineau, Phil (December 2005). A Seat at the Table: Huston Smith in Conversation with Native Americans on Religious Freedom. University of California Press. p. 253. ISBN 978-0-520-24439-9. Cousineau, Phil (2004). The Blue Museum: Poems. Sisyphus Press. p. 152. ISBN 978-0-9626548-2-4. Cousineau, Phil (November 2003). The Olympic Odyssey: Rekindling the True Spirit of the Great Games. Quest Books. p. 224. ISBN 978-0-8356-0833-6. Smith, Huston; Cousineau, Phil (September 2003). The Way Things Are: Conversations with Huston Smith on the Spiritual Life. University of California Press. p. 338. ISBN 978-0-520-23816-9. Cousineau, Phil (October 2001). Coincidence Or Destiny? Stories of Synchronicity That Illuminate Our Lives. Wes Nisker (foreword). Red Wheel / Weiser. p. 224. ISBN 978-1-57324-712-2. Cousineau, Phil (May 2001). Once and Future Myths: The Power of Ancient Stories in Modern Time. Stephen Larsen (foreword). Conari Press. p. 224. ISBN 978-1-57324-299-8. Cousineau, Phil (May 2000). The Book of Roads: Travel Stories. Sisyphus Press. p. 227. ISBN 978-0-9626548-1-7. Cousineau, Phil (November 2000). The Soul Aflame: A Modern Book of Hours. Robert A. Johnson (foreword); Eric Lawton (photography). Conari Press. p. 224. ISBN 978-1-57324-509-8. Cousineau, Phil (June 1999). The Art of Pilgrimage: The Seeker's Guide to Making Travel Sacred. Conari Press. p. 288. ISBN 978-1-57324-593-7. Cousineau, Phil (June 2012). The Art of Pilgrimage: The Seeker's Guide to Making Travel Sacred. Red Wheel/Weiser/Conari; Anniversary Edition. ISBN 978-1-57324-080-2. Cousineau, Phil (February 1994). Soul: An Archaeology: From Socrates to Ray Charles. HarperCollins Publishers. p. 249. ISBN 978-0-06-250239-1. Cousineau, Phil (February 1993). The Soul of the World: A Modern Book of Hours. Eric Lawton (photography). HarperCollins Publishers. p. 249. ISBN 978-0-06-250239-1. Cousineau, Phil (September 1991). Deadlines: A Rhapsody on a Theme of Famous and Infamous Last Words. Sisyphus Press. p. 121. ISBN 978-0-9626548-0-0. Densmore, John; Phil Cousineau (August 1990). Riders on the Storm: My Life with Jim Morrison and The Doors. Delacorte Press. p. 319. ISBN 978-0-385-30033-9. Cousineau, Phil (August 2014). The Hero's Journey: Joseph Campbell on His Life and Work. The Collected Works of Joseph Campbell. Stuart L. Brown (foreword). New World Library; Third Edition paperback. p. 336. ISBN 978-1-60868-189-1. Cousineau, Phil (August 2003). The Hero's Journey: Joseph Campbell on His Life and Work, Centennial Edition. Stuart L. Brown (foreword). New World Library. p. 288. ISBN 978-1-57731-404-2. Cousineau, Phil (May 1990). The Hero's Journey: Joseph Campbell on His Life and Work. Stuart L. Brown (foreword). Harper & Row. p. 255. ISBN 0-06-250102-X. A Seat at the Table: Struggling for American Religious Freedom A Kifaru Production. The Peyote Road: Ancient Religion in Contemporary Crisis A Kifaru Production. Narrated by Peter Coyote. Your Humble Serpent: The Life of Reuben Snake A Kifaru Production. Wiping the Tears of Seven Generations A Kifaru Production. Narrated by Hanna Left Hand Bull Fixico. Forever Activists: Stories from the Abraham Lincoln Brigade A film by Connie Field and Judith Montell. Narrated by Ronnie Gilbert, nominated for an Academy Award Best Documentary, Features. (1990). New York Times on "Global Spirit"